Now you can grow two family favourite apple varieties from one tree - space saving and easy to grow! Cooking Apple Bramley and Eating Apple Braeburn have both been grafted on to the same tree! This novelty and compact tree will reward you with pounds of cooking & eating apples for years to come. As the tree already has a 'V' shape this tree could be trained along a wall or fence. Supplied as a bare root, grower quality tree, grafted on a single rootstock with 2 apple varieties. 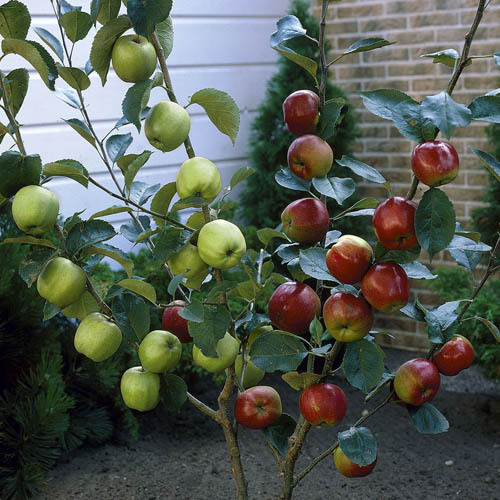 Apple Braeburn & Bramley Duo Tree - Now everyone can grow fruit trees in the minimum of space! These incredible duo fruit trees have been meticulously grafted by highly skilled nurserymen, to create 2 different trees growing on one rootstock! What's more, the rootstocks are dwarfing meaning that your trees will always remain compact! You will get 2 different varieties of fruit from 1 tree so are perfect for anyone who loves the idea of picking their own home-grown fresh fruit, but has limited space. Each of the varieties will produce bumper crops of delicious full sized fruit! Because they are already trained into a V shape, they are perfect for growing up a wall. Braeburn Apple The UK's most popular eating apple variety by far and will easily grow and flourish superbly in your garden! The crisp and juicy white-fleshed fruits have what is considered by most to be the perfect sweet/tangy flavour balance, literally providing a flavour explosion with every mouthful! The gorgeous fruit will be ready to pick fresh from your tree by mid-October each season and will store well until the end of January if kept chilled but frost free. Crops: October.